We all know that XML is "fat" and JSON is the "thinner", "faster", "smaller", "better" markup. We know this to be true because we've been told it over and over. It's "obvious" and "inherently true" because XML has redundant end tags, namespaces, entities and other extra "pounds of fat" that JSON doesn't have. But where is the science supporting this? What are the facts and what is myth? When people make design and architecture decisions it should be supported by facts not speculation. In this paper I show the results of an ongoing series of real world tests of Markup performance in browsers across a wide variety of devices, browsers and operating systems and attempt to quantify markup performance with experimental results and maybe trim the fat myth one calorie at a time. JSON is lean and XML is fat. We know this to be true. Here is a typical quote stated as an undisputed fact. Simply search the web or ask your friends and except for a few evangelist's XML vs JSON they will tell you the same thing. For people who want to promote and use JSON they often use this "fact" to support their cause. For people who want to use and promote XML they usually accept this and point to XML's other features that are more important. Yet few dispute this fact or attempt a systematic measurement to validate or disprove it. And when they do it's usually a very constrained test with a single corpus AJAX Performance. It's just true. The worst misconceptions are those which everyone knows to be true, and yet are completely false. Once a false idea gets into the public consciousness, however, they are very difficult to expunge, and rarely go away completely. When used to describe Markup, "Fat" has many factors and connotations. For the purposes of this paper the following attributes are investigated - size, shape, speed and looks. The total size of a marked up document matters for some purposes. The larger the size of the document, generally the more memory it consumes when parsed, the more space it takes in storage and the more time it takes to transfer over a network. However, a single measurement of size is misleading. Size can be measured in bytes, characters, nodes and other metrics - both on storage and in memory. 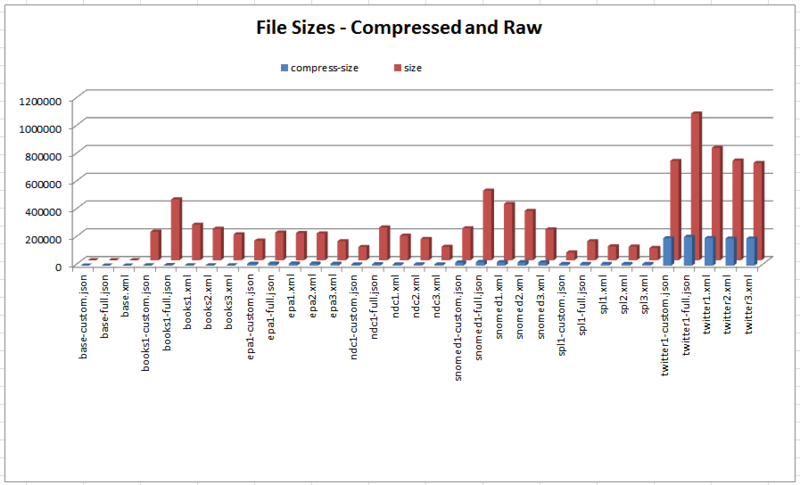 Encoding and compression can affect the byte size given the same character size in storage (and often memory). Choices of particular markup style representing the same document data can affect the number of characters; for example choosing shorter element names can produce a document with less characters. Markup choices can also affect node structure and size; for example using attributes in XML instead of elements for some data produces a different representation of the node tree itself which in turn affects the number of characters and bytes. There are many other considerations such as numeric precision, ignorable and boundary whitespace, defaulted attributes, use of namespaces etc. While some specifics are particular to the markup language the concept is valid in both XML and JSON formats. Thus given the same document as an abstract object, it is meaningless to attempt to provide a single measurement of its size as expressed in a particular markup format. However, one can measure specific sizes of a particular representation of a document. But even given a specific metric for the size of a document, does it matter? That would depend on what one cares about. Size is at best an indirect measurement of some other quantity one is interested in such as time to transmit over a network or disk space used. General intuition is that probably smaller is "better". However, to get a more definitive answer then that we need to ask "better for what and whom?" A binary compressed document may be smallest and better at conserving disk space but not better at readability, usability or parsing speed. The "Shape" or particular structure of a document matters for some purposes. For example, readability and ease of authoring by humans or machines may be important. The "shape" also affects the design of parsers, data models and programming API's. A particular shape may be better for some uses then others - an exact mapping to a particular programming language object structure may be useful in that language but cumbersome in another. Even in a single language some models may be better suited for direct access and others for searching. Shape of a document is hard to quantify, but I suggest that one can use "ease of use" as a proxy. A shape that doesn’t fit your use case is hard to use and could be considered "Fat" in terms of the difficulty of using it. When something is considered "Fat" it's generally implied that its "Slow". Speed matters. The time it takes to transfer a document from disk to memory, the time it takes to transfer across a network, the time it takes to parse and query a document - all matter. There is also developer time. How long does it take a developer to learn a language and write code to process a document? Sometimes speed in the small doesn’t mean speed in the large. The story of the Tortoise and the Hare can provide good reflection on this. As a practical example, imagine a document which is very fast to load into a programming language but the data format produced doesn’t lend itself for some use cases so extra processing, internal transformations to other models or use of complex and slow libraries may be required to access the document. For example it is common practice in JSON to embed HTML snippets as strings. If you want to search, combine or reformat them you may then have to construct an HTML document and parse it with an HTML parser to produce an object model which useful. The leanness of the original markup is lost in the overhead of having to perform multiple layers of parsing. Fat is generally considered "Ugly". A "Fat Markup" often implies an ugly one. If a document format is so ugly you can't stand looking it, you will try to avoid it. Fortunately "Beauty is in the eyes of the Beholder". This is true in markup as well as the humanities. As time, exposure, and fashion change so can the subjective beauty of a markup format. Sweeping statements of technologies like "Fat", "Slow", "Bloated" have imprecise meaning. Worse they are often chosen to pull in emotional associations which may not apply to the specific cases. So even if it were considered true, what does it mean by saying "XML Is Fat"? I suggest it means very little, actually of negative usefulness. A markup itself is not used in isolation; it is used in the context of complex work-flows including editing, distribution and processing. So what should one do to characterize a Markup Language in a meaningful and useful way? I suggest a path lies in defining tests that measure specific use cases and provide reproducible metrics. These metrics can be used to get a better understanding of the performance of markup in a meaningful way. I designed an experiment to attempt to quantify some of the attributes attributed to "Fat Markup". In particular I focused on what is generally considered an already answered question in particular because I would like to validate that the "common wisdom" is in fact based on fact, and if so or not, to what degree and in what exact cases. The Experiment focuses on performance of JSON and XML in the use case of being delivered by a standard web Server and being parsed and queried in a Browser. Furthermore, mobile devices are becoming vastly more prevalent then in the recent past and little research addresses Mobile Browsers so I attempt to include them as much as possible in the tested scenarios. The Experiment I developed attempts to test the following attributes of XML and JSON processing. Most of the past publications I have found focus on a single corpus of documents and usually attempt to derive a single metric. These are often very artificial, focused on a single domain or structurally similar. For this experiment I take 6 very different documents and a baseline to attempt to cover a range of document uses 'in the wild'. Subsets of larger corpus and duplication of smaller datasets were chosen so the resultant XML and JSON sizes ranged from 100 KB to 1 MB. These limits were chosen so the size was large enough to take noticeable time to load, parse and query but not so large as to break most reasonable browsers even on mobile devices. This is a very basic baseline document. It consists of a root object and a child object with 3 properties. This baseline is used to sanity check the test to make sure proper counting of size and nodes could be easily manually validated. This is an expanded sample of the BOOKS sample distributed with Saxon Saxon. It contains 600 book items, with 300 categories. A portion of the EPA Geospatial data at http://www.epa.gov/enviro/geo_data.html containing a collection of 100 FacilitySite records. A subset of the National Drug Code Directory at http://www.fda.gov/drugs/informationondrugs/ucm142438.htm containing a collection of 1000 FORMULATRION records. A subset of the SNOMED concept database from http://www.nlm.nih.gov/research/umls/Snomed/snomed_main.html containing a collection of 100 SNOMED concept records. A collection of 1000 random tweets from a search of Super Bowl and advertiser terms. Identifying data from the collection was anonymized by randomizing the user names and ID's. Most research I have found makes the incorrect assumption that there is a single representation of a document in a particular markup. I take a different approach. Starting with seven (7) different documents I produce 2 variants in JSON and 3 variants in XML that all represent the same abstract document. These documents span several data styles including simple tabular, highly structured and document format. Some of the corpus is synthetic and some taken from real world data. In addition I test the support for HTTP gzip compression on these documents. For JSON documents I produced 2 variants. One variant similar to the default XML to JSON transformation from json.org ( http://www.json.org/java/index.html ). This variant, while fully expressive is generally not what a JSON developer would expect. However, it is what a naive XML to JSON transformation may produce. The second JSON variant is a custom transformation informed by the specific data structures and is close to what a JSON programmer might expect from a JSON format. In both cases extraneously white-spaces are removed. The following is an example of a single JSON object in the twiter-1full.json. This is representative of a naive conversion from XML using code similar to that at json.org. Whitespace, newlines and indentation was added for presentation only; it does not exist in the actual document. This is an example of the same record represented in a format that a native JSON developer may expect. Whitespace, newlines and indentation was added for presentatin only; it does not exist in the actual document. For the first format I used the "native" XML format (if the document originated as XML) or a naive transformation from the object model to XML. For the third XML format I transformed the XML into an attribute centric format. This was accomplished by taking all XML elements which contained only text content, no attributes, and is not repeating and transformed that element into an attribute. What follows are 3 examples of the same twitter record as used for the XML documents. The following table lists the corpus documents, types, and sizes (raw and compressed). This data is stored as a resource (index) and is available to the client on start-up. The experiment contains a Server, Browser, and Analysis components. The components were created using standard open source software and as much as possible designed to focus on the attributes being tested and eliminating introduction of bias from components which are not related to the test goals. The Server component provides two roles. It serves the source data used by the Client and collects the results submitted by the client. Results from the client are sent back to the server via an HTTP POST. The server runs a CGI script which formats the results and queues them to a message queue. A data collection script periodically polls the queue for new results and when it receives one enriches the results by expanding the UserAgent string into sub-components for easier identification of browser and OS versions. The results are then stored locally as an XML file and also published to a database for future analysis. The mechanism used to report results is independent of the tests themselves, do not affect the test data and could be replaced by other analogous methods. The only Server component that could affect the tests is the serving of static JSON and XML corpus documents. These are exposed as static resources with HTTP GET, with and without gzip compression enabled. On start-up the client requests an index document and shows a list of all files in the corpus, their types and sizes. The user can choose to run tests individually or as a whole. There is one button which when tapped runs all tests then submits the results to the server via an HTTP POST. The time it takes to load, initialize and update the GUI, and to send the results is not included in the results. Publicly available data available to the client program (browser) is also included in the results. 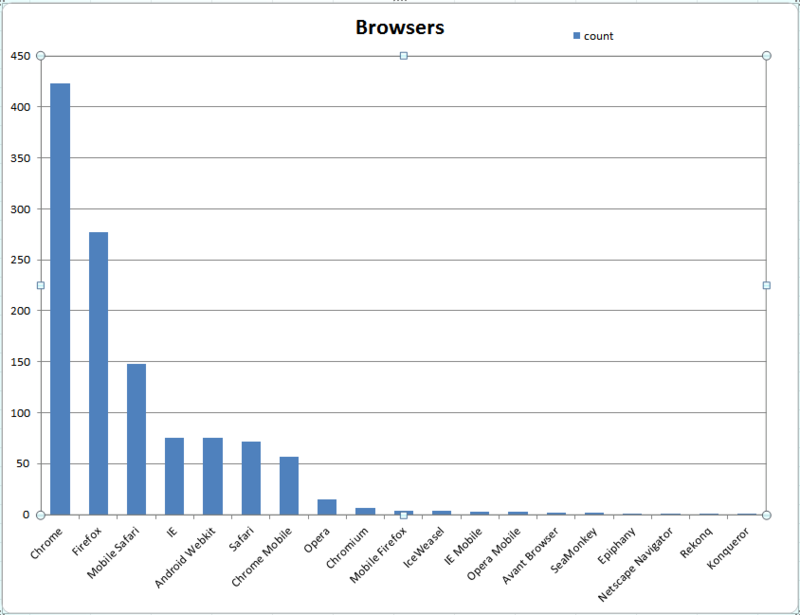 This data is used to identify the browser and OS of the client. When the "Run All Tests" button is tapped the following procedure is run. For each of the files in the index the following is performed and individually timed. The data file is fetched from the server in raw (not compressed) format and stored as a string. Where possible the actual Content-Length is used to update the data size metric for this file. The data file is fetched from the server in compressed (gzip) format and uncompressed and stored as a string. Where possible the actual Content-Length is used to update the compressed size metric for this file. The object is "Queried". To simulate a consistent query across the variety of the corpus all nodes of the document are recursively descended and counted. The number of nodes visited is recorded along with the elapsed time. The data is again parsed into an in memory object. For both JSON and XML files, jQuery is used to parse the document and produce a jQuery object. The object is "Queried". To simulate a consistent query across the variety of the corpus all nodes of the jQuery document are recursively descended and evaluated. The number of nodes visited is recorded along with the elapsed time. In addition to a variety of data sources and formats, the experiment attempts to cover a range of devices, operating systems, browsers and networks. This is achieved by "crowd sourcing". The URL to the test was made public and distributed to a range of mailing lists and social media sites including Amazon Mechanical TurkMechanical Turk. Ideally this experiment can continue for a long duration so that trends over time can be measured. It is expected that performance varies considerably across devices, especially mobile devices, and prior research has largely ignored differences across devices. Only the browser "User Agent" string is used to distinguish browsers, devices and operating systems. This makes some measurements impossible such as distinguishing between broadband, wifi, 3G, LTE and other networks. However, even lacking some measurements and precision, seeing the range of performance across platforms is still educational and useful. At the time of this paper approximately 1200 distinct successful tests results were collected. XML is inherently larger then than JSON. This is known as 'obviously true' due to several factors inherent to XML markup. The end tags of XML duplicate data in the start tags making the total text longer. Namespaces, prefixes, entities, comments, PI's and other XML features add bloat not present in JSON. JSON has a direct concise representation for arrays which XML does not. These are all reasonable presumptions, but how much do these things contribute to data sizes? In real use how much difference does it make? One of the features of modern markup is that we sacrifice some compactness in exchange for readability and usability. If the most important goal was compact size we would be using specialized binary formats. In any case let's look at the actual measurements from the corpus. For the most part size is a static feature of the data files themselves, although this can be affected somewhat by the transmission protocol. Experimentation has shown that overwhelmingly the static data size is very close to the HTTP transmitted size of anything but very tiny documents. HTTP does add a little variable overhead such as chunked encoding and headers, but this is very small. 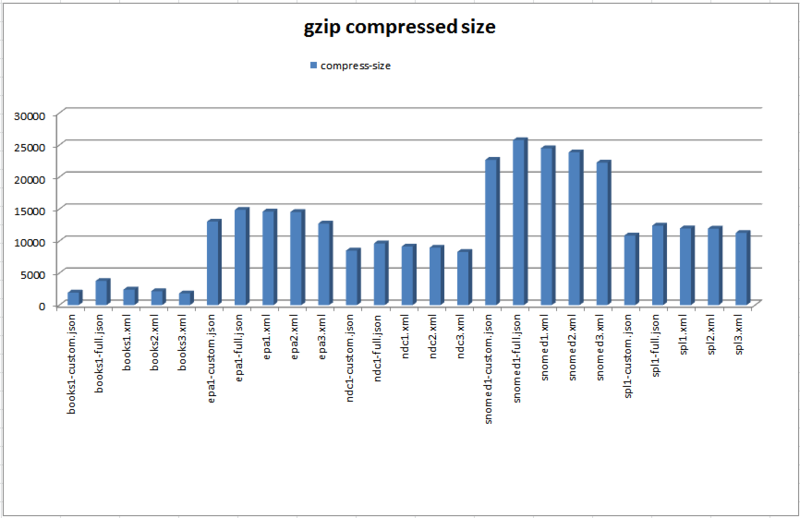 The gzip compression available in HTTP 1.1 has been shown to be equal in size to using the "gzip" command. For the purposes of Data Size we shall examine the static size of the documents on disk. All documents are stored in UTF-8 encoding as plain text files. As we can see from Figure 9 and Table I, for each data set the XML and JSON file size can vary significantly depending on the formatting choices used. However, if one carefully chooses a formatting style to minimize size then XML and JSON come very close with XML smaller in some cases and JSON in others. Looking at the compressed sizes of the files in Figure 10 we can see that the file sizes are very close regardless of formatting style. The predominant factors influencing data transmission speed are the size of the data transmitted and the network speed. In addition, processing speed of the client (browser) and server have some influence as well as packet losses and other internet related issues. Mobile networks generally have significantly higher latency so are more affected by packet loss and retransmission. This experiment focuses on measuring end to end speeds of HTTP from server to browser using uncompressed and HTTP gzip compression across a range of devices and browsers. It does not attempt to examine the root causes of network bandwidth and traffic. The range of devices and networks produces a large scatter of transmission speeds. While the trend is that uncompressed and compressed data are fairly linear with respect to bytes transferred there are a lot of outliers. 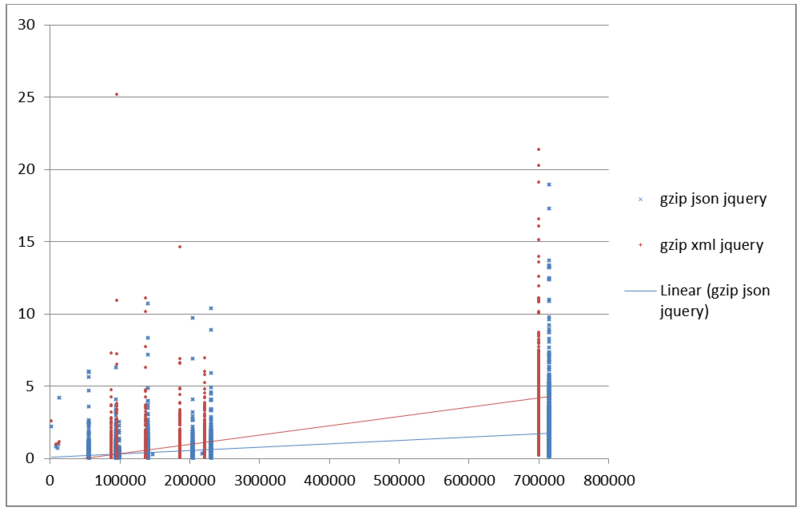 Note that each mark represents the same base document requested uncompressed then compressed via HTTP. 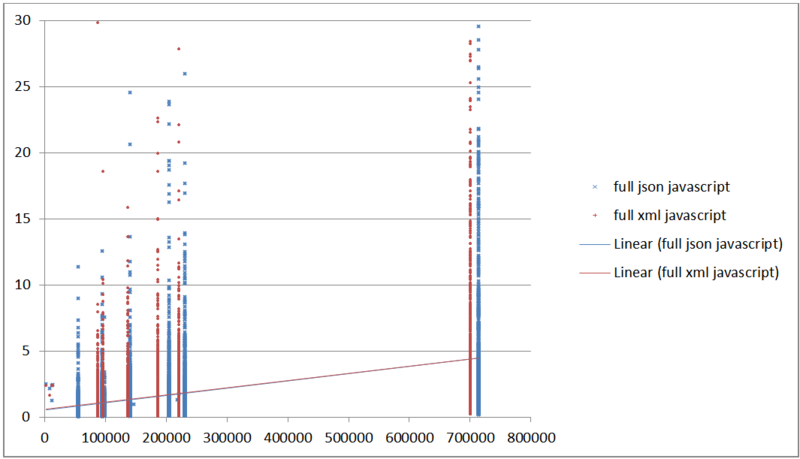 If network speed was identical for both then the marks would have x and y values equal, forming a tight line. Rather we see significant amount of outliers. 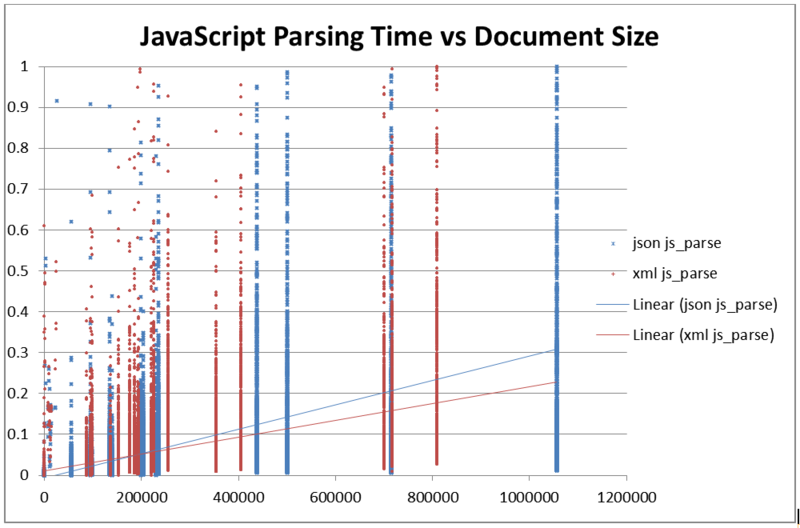 Parses time in seconds for jQuery (y) vs size of raw document in bytes (x). Testing query across markup languages and a diverse corpus is tricky to achieve without bias. For the purposes of this experiment I postulate that the purpose of loading the document (JSON or XML) is to use all of it's data in some form. Therefore to simulate a fair "query" I perform a recursive decent of the parsed object's document model and count every node. There are certainly many other equally good definitions of "query" but I wanted to have a similar test across all the corpus that has a reasonable relevance to typical use cases. 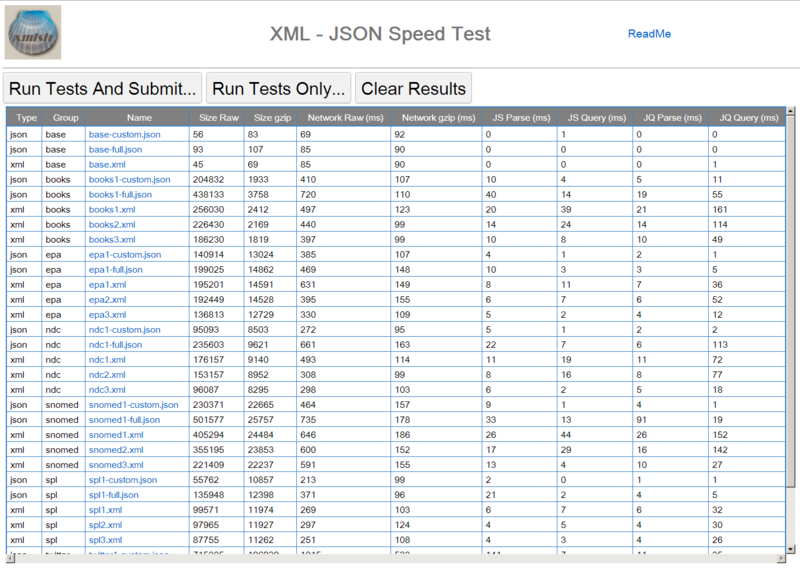 Taking a look at the query times however, JSON clearly has an advantage over XML in pure query times. jQuery clearly imposes a significant penalty on XML query but it also imposes a huge penalty on JSON query. Query speed in seconds using jQuery (y) vs file size (x). It is interesting to see how everything adds up, but so far we've seen the forest not the trees. What does it look like for a particular user? Where is time spent for a specific document on a particular browser and OS? 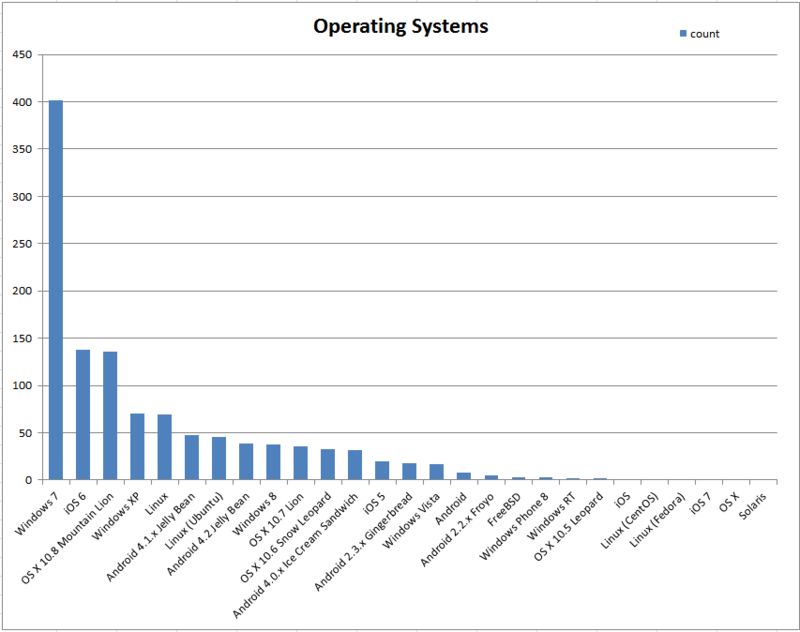 Since the experiment collects data from such a wide variety of systems it's difficult to show a meaningful view of this. Averages and even percentiles mean very little when looking at data that spans orders of magnitude. Instead lets look at a couple typical test results which might help make sense of the big picture. In the following charts, the vertical axis is time in seconds (more is slower), and the horizontal axis represents one combination of "User Agent" + either JSON or XML (for every user agent there is two columns of data). Network transfer time is indicated as blue. Parsing time is indicated as red. Query time is indicated as green. In Figure 28 we can see that the total time is dominated by network transmission time. Mobile browsers such as Android Webkit, IE Mobile and Opera Mobile take more time in the parsing and query layer probably due to their slower CPU. Median total times in seconds (y) for Twitter document, raw file using jQuery vs. user agent (y). User Agent is often a proxy for device type. 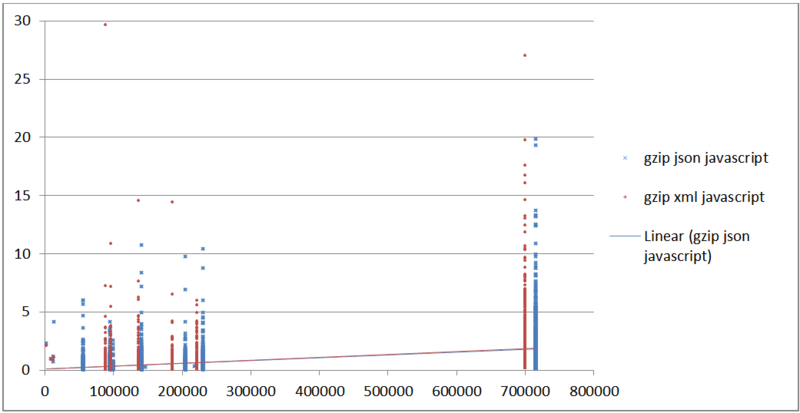 In Figure 29 notice the change in the vertical access to accomidate for large time spent in query and parse on some devices. Network time remains the same but in many more cases are parse and query time a larger contributor. 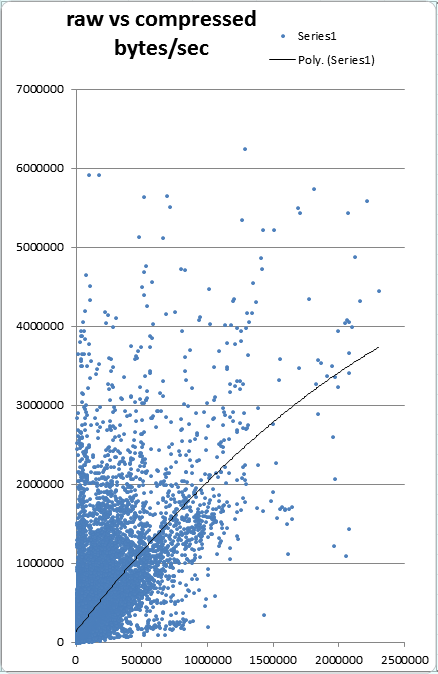 In Figure 30 notice the change in vertical axis. 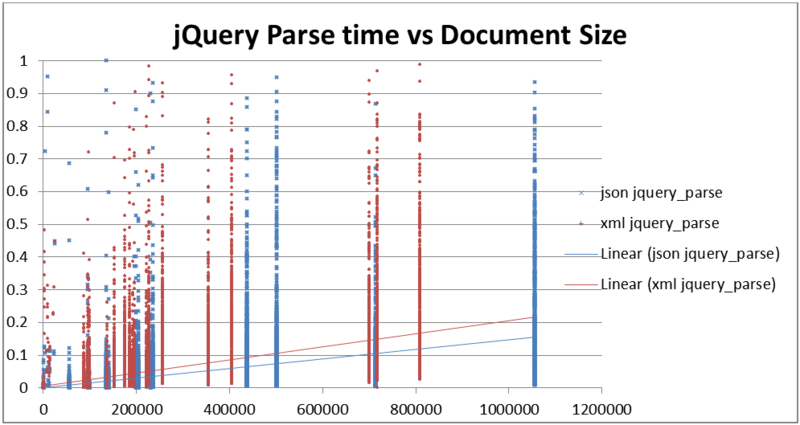 The total time is dramatically smaller revealing the relative times for parse and query being a larger portion of the total time, especially on mobile devices. Median total times in seconds (y) for Twitter document, compressed using jQuery vs User Agent (y). User Agent is often a proxy for device type. 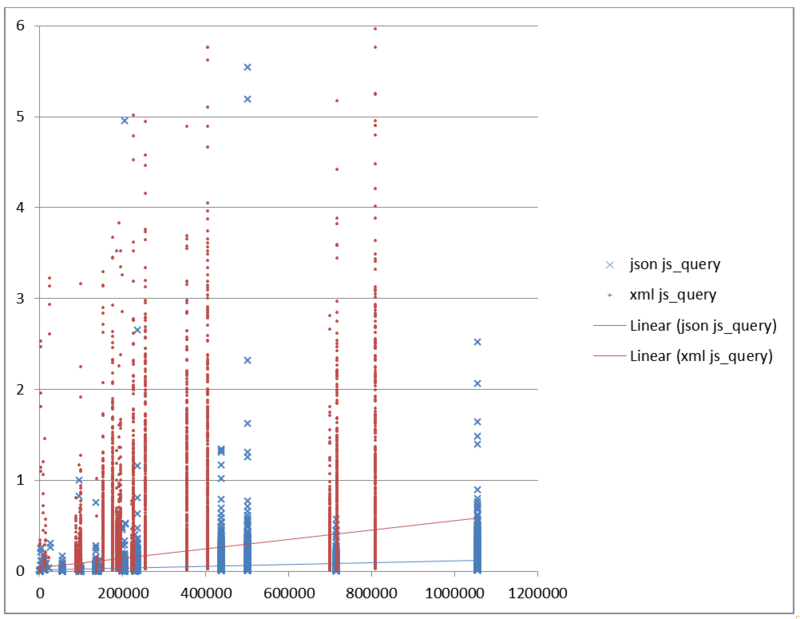 In Figure 31 we can see the impact of using jQuery on mobile devices especially for XML. The topic in general and the experiment in particular are difficult issues to address. The topic itself is "slippery". How does one address a generalized concept where the basis is ill defined and the generalization is hazy? What is trying to be proved? The experiment only addresses a few questions from a huge range of possibilities. Focusing on the experiment itself there are many specific issues which could be improved and should be addressed in future experiments. Additional experiments involving server to server communications would be useful to collaborate the findings and expand on the range of analysis. The nature of the client program is such that server errors are not reported. If things go wrong in the client then no record is reported. Only by out of band information have I discovered issues such as individuals who were not able to run the test. For example IE versions 8 and below were particularly problematic and reports indicate it would stop part way through the test. Future experiments should have a means of better reporting of errors. In addition approximately 1% of the results showed meaningless data most likely a result of a browser error. An example is tests that report negative times or file sizes. These tests were excluded from the analysis. The Corpus was designed to span a wide range of use cases, but ultimately any sample set of data is limited and biased. Future experiments could improve on the variety and focus on if different types of data perform differently. The parsing test does not attempt to do very much with the data besides walk the parsed tree. More complex tests could be performed that attempt to do something with the data such as create new objects or search for specific values. I choose this test as a bare minimum that could be universally applied to the entire corpus but acknowledge that it could be biased in that it does very little with the parsed data so may not reflective of real world use cases. This experiment produced a lot of data. Compared to many scientific experiments the data size is trivial, but for the purposes of distilling down a few basic principles the amount and variety of test results is daunting especially in its variety. 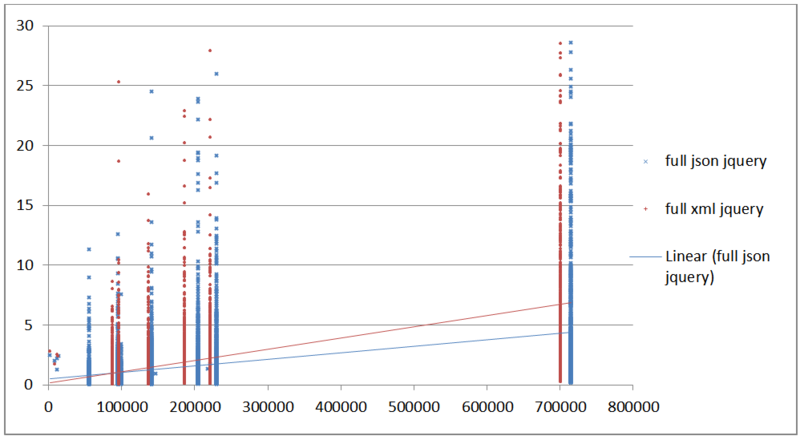 On the other hand, more data is better than less and this experiment improves on many attempts to categorize markup performance in browsers. I am hopeful that the experiment can run for a long duration so that ongoing analysis can be performed. The raw data will be provided for those who wish to analyze it themselves. This paper focuses more on showing the range of results with visualizations and trends rather than traditional statistical analysis. However this seems less scientific and exact then ideal. Many more visualizations and analysis would be useful but are limited by forum of publication and time, imagination and skills of the author. Suggestions on improvement of the analytics and visualizations are greatly welcome. Due to a lack of an army of volunteers and a vast personal collection of hardware, crowd-sourcing was used to enlist participation. This produced a good number of responses (about 650 as of this writing) but is likely to include self-selected bias. The distribution channel for the solicitation and people who volunteered to run the tests may well not be a statistically good sample set. Future experiments should focus on getting a wider range of people to perform tests. In order to acquire more test samples, Amazon "Mechanical Turk"Mechanical Turk was employed to hire additional testers focusing on mobile devices. This added about 500 additional responses in a 3 day period at an average cost of 15 cents (USD) / test. Architects and developers who are seriously interested in maximizing performance should consider the following. The use of HTTP compression, regardless of the device, operating system, browser or markup language is the biggest factor in total performance, and by inference, user experience. Use of HTTP Compression should be used in most cases where large amounts of data is being transferred from server to client. The exception is that in some cases under powered devices can actually perform slower with compressed data then uncompressed data. If you are targeting low end mobile devices then using your own tests to validate customer experience is suggested. 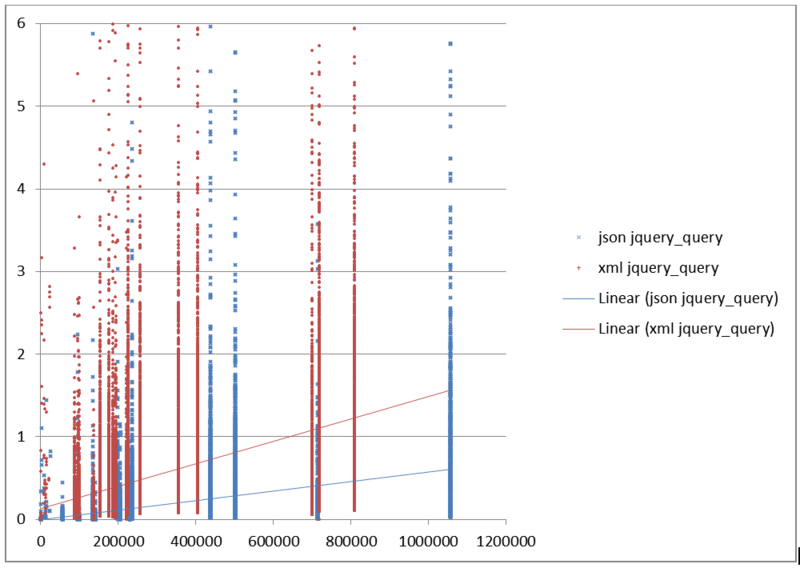 The choice of JSON vs XML is nearly indistinguishable from a performance perspective. There are a few outliers (such as Mobile and Desktop Firefox using jQuery) where there is a notable difference but as time goes on and vendors pay attention to user feedback I expect these differences to be reduced. But for most uses the difference in markup choice will result in little or no user noticeable difference in performance and end user experience. There are significant browser architectural changes coming such as HTML5 and Chrome Blink Blink. We don’t know what performance changes these will incur but evidence suggests that performance in the browser is a main goal of new browser technologies. Looking to the future the landscape may change. Engineering is about balancing compromises. Make the compromise that maters to you, your product, your business and your customers. If performance matters to you and your applications - do what it takes to achieve maximum performance. If it doesn’t matter then use whatever technology is easiest for you. Often the "you" is many people in an organization or across organizations. If its harder for the producer of data to change formats then work with them to use their format. If its harder for the consumer to change formats then work with the producers to produce the format the consumer needs. In any case make this decision based on facts not myth. Is Data really your problem ? This paper focuses exclusively on data transmission, parsing and querying. It may well be that in your application that component is a small piece compared to display and business logic. If the data layer is not a significant part of your performance or development problem then it may not be worth the effort to optimize it. As your application evolves your data use may change so always be open to re-evaluating decisions made early in the design process. Don’t believe blindly what you are told. Perform experiments, test your own data and code with your own users and devices. What "seems obvious" is not always true. As always with engineering; experiment, develop, test. And test again. The source code and data corpus is published at https://code.google.com/p/jsonxmlspeed/. The raw results for this experiment will be published along with this paper for peer review. Test it. Dispute it. Come up with better tests and publish the results. It is hoped that an ongoing interactive web site will be developed to continue to track, analyze, and monitor this research. Although interestingly he claims that JSON is neither a document format nor a markup language. JSON is not a document format. It is not a markup language. The service "user agent info" http://user-agent-string.info/ was used for this enrichment.